I like many forms of metal music, but I’m afraid the black metal sub-genre does nothing for me musically, particularly as far as the vocals are concerned. The Satanic themes aren’t my scene either. Black metallers in most cases really are Satanists, unlike most metal musicians who are mistakenly thought of as Satanic by some fairly clueless individuals but who are nothing of the sort. Where black metal does score points for me is on the costume front. These guys put a lot of effort into trying to look more evil than each other, and the results are frequently hilarious. Do a Google image search if you dare, but don’t have your mouth full when you do or you may need a new keyboard. Some images may be considered offensive. One of the big names in black metal is Gaahl, formerly of the band Gorgoroth. Like many black metal bands, Gorgoroth is from Norway. The antics of the various band members, particularly Gaahl, make for interesting reading (some language may be considered offensive). Unfortunately, I have lost the source so I can’t give copyright credit for this image. If the copyright holder wishes to contact me, I’ll be happy to correct this situation. Edit: The Gaahl photograph is by Peter Beste. 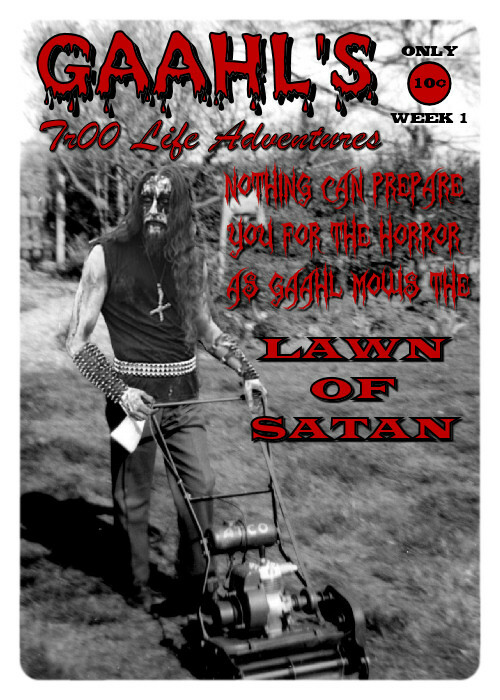 Without further ado, here is the first week’s edition of Gaahl’s Tr00 Life Adventures. Click the thumbnail to see the full size image. didn’t read the post, but the last image is just [ROFL]. Steve, once again you’ve outdone yourself. These are pure gut-busters! We’ve got a ton of positive email on your original artwork. Don’t stop dude! JV, thank you very much. I will put a credit in all of my Tr00 Life Adventures posts and contact Peter to see if he has any objection to my use of his photograph.